People in 45 districts on Thursday voted in the second and final phase of House of Representatives (HoR) and Provincial Assembly (PA) elections, with the Election Commission (EC) putting voter turnout at 67 percent, slightly higher than the first phase polls held on November 26. The completion of two-phase elections will now ensure a federal parliament, after the formation of the National Assembly, at the centre and provincial assemblies in seven provinces as envisioned by the new constitution adopted in 2015. Local level elections were held in three phases in May, June and September. “The Election Commission believes that these elections have contributed greatly to the implementation of the constitution, ending the political transition,” said Chief Election Commissioner Ayodhee Prasad Yadav at a press meet held after voting concluded on Thursday evening. Despite incidents of blast and attack on candidates in the run-up to the second phase polls, voting in all districts save Arghakhanchi concluded peacefully with massive participation of the people, said the EC. Re-elections will be held at two polling centres of Arghakhanchi in a few days, it said. People on Thursday voted to elect 128 members for the HoR and 256 members for PAs. The November 26 polls were held in 32 districts to elect 37 members for the HoR and 74 members for the PAs. There were a total of 12,235,993 voters for the second phase of elections. The EC has said 67 percent voter turnout is a preliminary estimate and that it could go up. 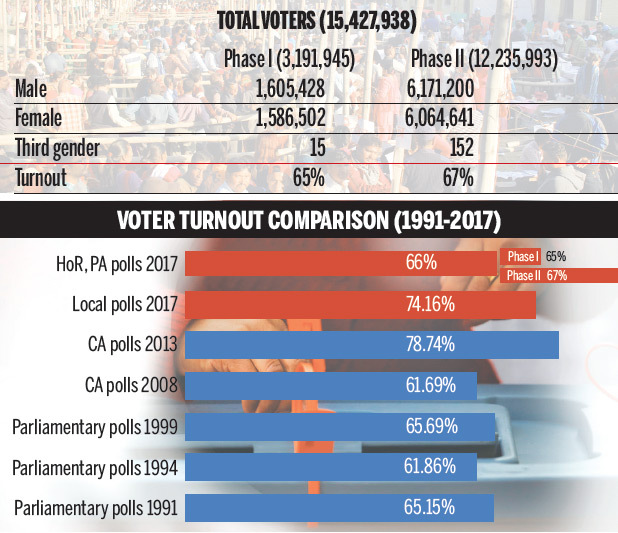 While voter turnout in local elections was 74.16 percent, the two Constituent Assembly polls in 2008 and 2013 had seen 61.69 percent and 78.74 percent turnout respectively. Former chief election commissioner Neel Kantha Uprety, however, termed the voter turnout “satisfactory”. be outmigration of large number of voters over the last four years,” said Uprety. “During our observation in various polling centres in Kathmandu Valley, Chitwan, Tanahun, Kaski and Syangja on Thursday, we found overwhelming participation of women,” Uprety added. According to the poll body, Gulmi district witnessed the highest voter turnout at 71 percent.